The world's first ever international motor rally took place in the summer of 1907. Five pioneer motorists all larger than life characters - shipped their cars to China to race half way round the globe to prove that the motor car could provide an independent means of travel. 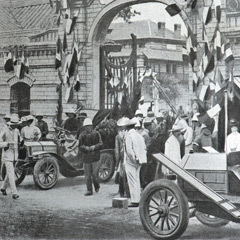 When they eventually arrived in China (the event having been cancelled at least twice), the Chinese authorities said that no car should be allowed to start. Regardless, they set off, in an event with no officials, barely any rules or regulations, no proper organisation, and no garage assistance, recording their positions by sending telegrams to relay stations at towns and railways junctions along the route. It quickly settled down to be a race between a Prince and a Pauper... The prince was Italian Prince Scipio Borghese and his main challenger a fairground roustabout called Charles Goddard (right) who had no money, but possessed a quick wit and an even quicker tongue. He persuaded all manner of supporters to back his efforts. Having borrowed a car, tyres and money, he sweet-talked his way onto the boat and even relied on his rival competition for fuel. The race went into the history books - and is still talked about today. For the next 90 years, a follow up anniversary drive from Peking to Paris has been impossible. Now the thaw in international relations makes the dream a reality. Drivers from more than 24 nations are determined to be on the start line in Peking for a remarkable drive that takes in deserts and numerous mountain climbs, for a an epic challenge half way round the world, to keep an appointment with history - driving from Peking to Paris. The 40hp, four cylinder Itala, driven by Prince Borghese, with Ettore Guizzardi as mechanic and journalist Luigi Barzini as passenger. Its laden weight without crew was 2000kg. The 15hp four-cylinder Spyker , driven by Charles Goddard, with Jean du Taillis as passenger. Its laden weight was 1400kg. The 10hp, 2-cylinder de Dion-Bouton, driven by Georges Cormier, with Edgardo Longono as passenger. Its laden weight was 1400kg. An identical de Dion-Bouton, driven by Victor Collignon, with Jean Bizac as mechanic. The 6hp, one-cylinder, two-stroke Contal tri-car. driven by Auguse Pons, with Octave Foucault as mechanic. Its laden wright was 700kg.